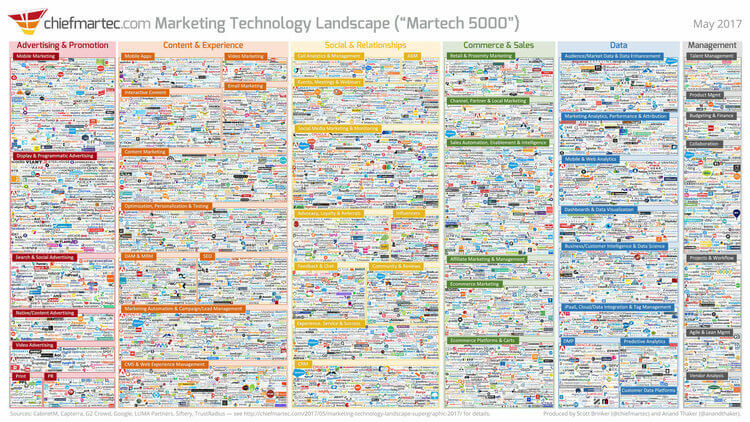 Whether you’re managing one pay-per-click account or forty, chances are that a million different tasks vie for your attention on a daily basis. Have you added negative keywords lately? Did you respond to your client’s email with their requested report? Will your campaign hit your target spend and conversion rate? It can be impossible to manage everything without some serious dedication and tooling. If your PPC “management style” is to track of all your accounts and campaigns in your head, the best-case scenario is that you’ll hit your performance and spend targets most of the time. The worst case is that you overspend your PPC budget so badly you lose a client or even your job. Luckily, ppc budget management tools exist to help digital marketers manage PPC performance and spend. Each have standout features that improve spend management, but they also have limitations as well. We outline the pros and cons of each to help you choose the right option for your organization. Google, Bing, and Facebook each offer functionality to help advertisers manage campaign spend directly within their advertising platforms. All three offer the ability to set up “Rules.” Rules can be set to pause an individual campaign once its total spend reaches a predetermined cap. Google and Bing also offer shared budgets which can be used to control spend for a group of campaigns. Shared budgets work by tracking the combined daily spend across several campaigns. Once the daily spend reaches the budget cap, all campaigns in the shared budget stop showing ads for that day. Finally, account limits can be implemented to manage total account spend. Account limits can be implemented through billing methods (prepay/postpay settings) or by setting an account lifetime spending cap. However, controlling account spend using payment settings is not recommended. Your billing thresholds may rise over time as you accumulate a history of successful payments which could lead to overspending. Many digital marketers consider spreadsheets an irreplaceable tool for everything from reporting to PPC budget management. Spreadsheets work well for managing multiple PPC accounts across several advertising platforms because they allow marketers to combine and track data from many sources in one place. With some training on spreadsheet functionality (including pivot tables, vlookups, and macros), you can create a custom budget tracking solution as simple or advanced as you wish. Google Sheets is also making it easier for marketers to import and refresh data automatically from sources including Google Analytics, Google Ads, and more with both free and paid data connectors. - Split and analyze data by channel, networks, campaigns, ad groups, etc. - Templates must be replicated and updated for new accounts, clients, and campaigns. 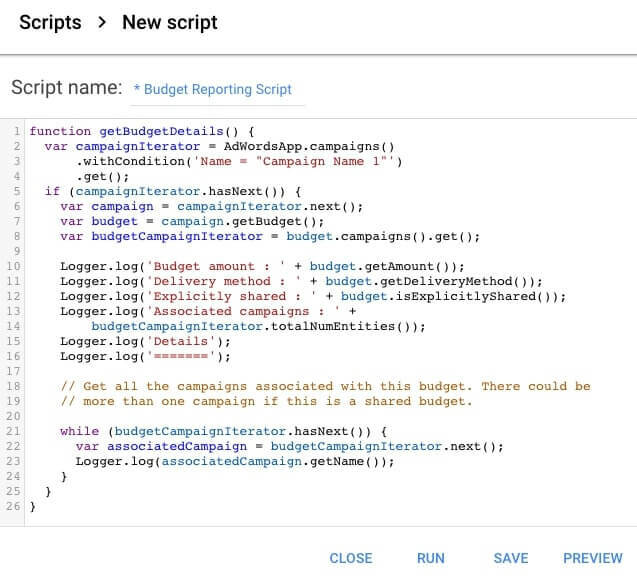 Scripts can be used to track and manage PPC budgets. For example, a script will allow you to track when a campaign hits its budget cap. The next time the script runs, the script will pause the campaign. 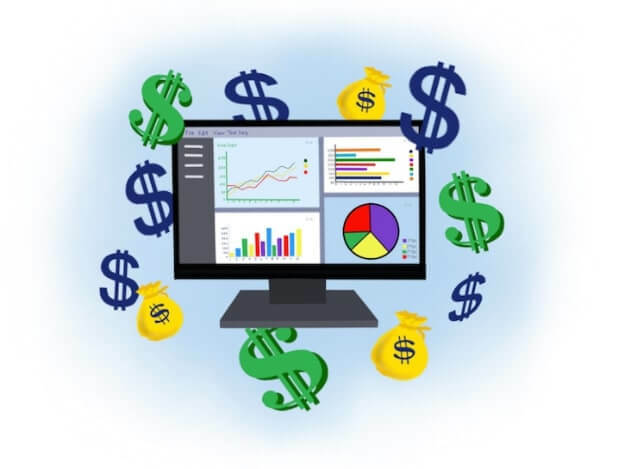 Several software solutions have tried to take on the challenge of PPC budget management. Among their numerous other features, major PPC software providers such as Marin and Kenshoo provide advertisers the ability to monitor campaign spend and change campaign status directly from their platforms. Smaller PPC reporting providers such as ReportGarden, NinjaCat, and SuperMetrics have also more recently added spend reporting to their offerings. But, few option exist for affordable PPC budget management software that does it all: tracks client and campaign spend across multiple advertising networks; automates budgeting processes such as pausing or enabling campaigns based on available budget; and provides intuitive reports that show how campaign spends are progressing toward their budget goals. Full disclosure: that's why we decided to build a platform to do just that: Shape Integrated Software. Keep reading for more information about Shape and how to connect with us below. In our previous roles as PPC Account Managers, we cycled through all of the solutions above and found that no one solution was perfect. That’s why we created Shape—to help PPC marketers improve their budgeting processes for a fraction of the cost of major software solutions. Shape automates repetitive, tedious budgeting processes; provides marketers flexibility in how they group and optimize campaigns; makes recommendations to advertisers that they can increase spend and performance; provides basic reporting; and much more. We know there are no shortage of options to choose from when selecting a PPC budget management solution. It may take time to find the best solution for your organization based on your needs and tooling budget, so don't be afraid to test multiple solutions before you commit!